What inspired you to caucus on Tuesday? 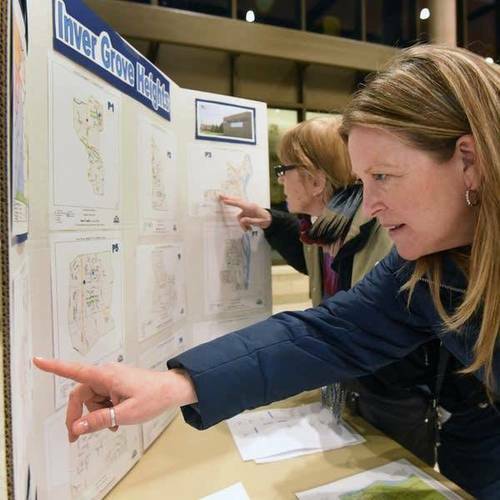 Political parties held precinct caucuses Tuesday night.Did you attend yours? Tell MPR News about your experience and what brought you out to cast your ballot. Who do you support for governor in the upcoming election? What is the key reason or issue you support this candidate? Who did you support for President in 2016? Share your experience in the comments and discussion below, or fill out this survey. 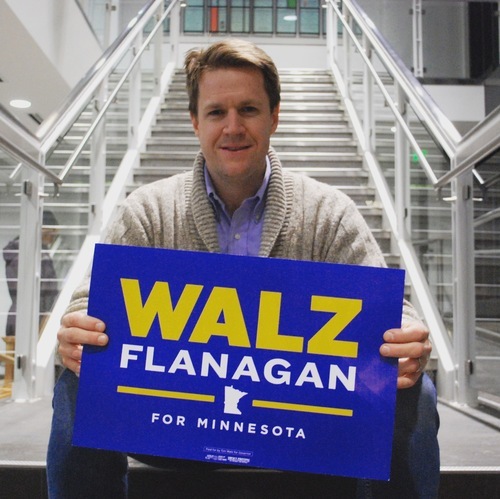 Nathaniel Wood is going to his precinct caucus in support of Tim Walz and Peggy Flanagan because he says "It’s a team that can bridge the growing divide between the cities and Greater Minnesota." Susan Christiansen of St. Paul is supporting Rebecca Otto at her caucus, because she says "I like the plan she’s laid out on her website — lots of interesting ideas. She also makes a compelling case for her ability to win out-state votes. Beyond that, I’d love to have a female governor (at long last.)" Jeff Diamond is going to his precinct caucus to support Rebecca Otto for governor, because he says "She has specific policy proposals that are well-researched, thoughtful, and in line with my values and beliefs." Christine Carragee is attending her precinct caucus — "have to engage in local politics to make our community better," she said — and will be supporting Rebecca Otto for governor, with "single payer health care and environmental protection" being important issues. "The 2016 presidential election made it clear that a large chunk of people in America feel left behind. Tim Walz has been serving people all of his life, as both a teacher and a soldier, and he's proven that he can relate to people and win in rural areas and smaller communities. It's clear to me that Tim and Peggy truly care about helping people." Grecia Glass says "voting is not enough. Citizens have the responsibility of being well informed and active citizens." Glass will be supporting Tina Liebling for governor because, "she is progressive and I believe she can communicate with Republicans." 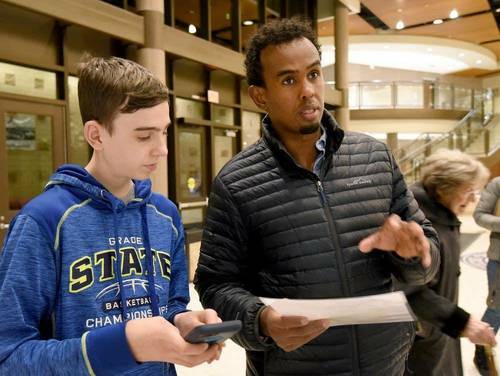 "I really want to vote some of these people out," said Abdiaziz Dafar, who is attending his first DFL caucus at Simley Senior High School in Inver Grove Heights on Tuesday February 6, 2018. "I'm excited. I want to turn things around," he said. Assisting Dafar is volunteer Nicholas Reising, left. "Here I am," said first-time caucus goer Sherry Warrick, who locates her precinct at a DFL caucus at Simley Senior High School in Inver Grove Heights on Tuesday February 6, 2018. "I'm excited. I want to learn what these candidates stand for," said Warrick, a member of the ISD 199 school board. Ross Dybvig is supporting Tim Walz for governor at a precinct caucus tonight because of Walz's "electability" and ability "to bring in moderates." 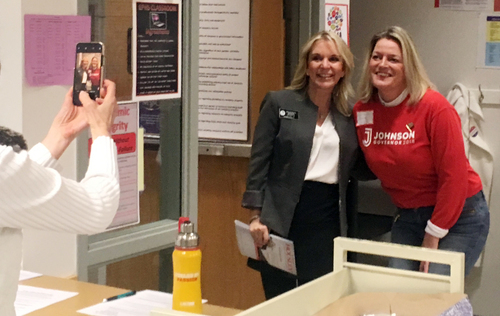 At Eden Prairie High School, Minnesota voters start the 2018 election process and pick their favorite candidate to replace Gov. Mark Dayton. 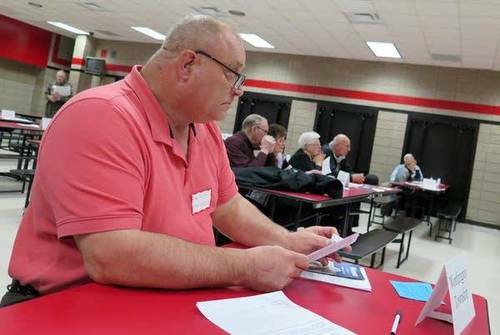 Dan Bogie of Worthington was among about 20 people at the Republican caucus in Worthington in southwest Minnesota on Feb. 6, 2018. Brendan McManus is a history professor at Bemidji State University. He's caucused for years, but says he was more motivated than usual this time around. He was one of a dozen locals to come out for the fourth ward Bemidji DFL caucus. He says the most important issue of the night is the upcoming race for governor -- though at the start of the caucus he hadn't chosen a candidate. Fred Green of Minneapolis attended a caucus tonight in support of Rebecca Otto. He said he supports Otto because "she shares my values and has visibility as (state) auditor." 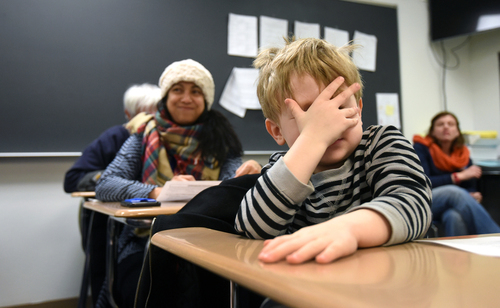 Three-year-old Markus Niemioja toughs it out during a Precinct 1 discussion of rules during a DFL caucus at Simley Senior High School in Inver Grove Heights on Tuesday February 6, 2018. "He's actually kind of sort of used to these kinds of meetings," said his mom, Elizabeth Niemioja, right. Photo by Richard Marshall for MPR News. 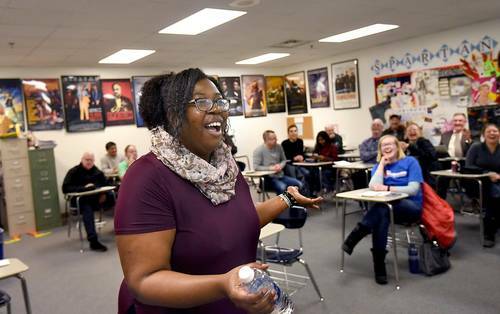 "I have to say it takes a bit of nerve to be up in front of a crowd like this, but I have to be accountable," said Ruth Richardson, candidate for House of Representatives District 52B, who laughs with Precinct 4 members during a DFL caucus at Simley Senior High School in Inver Grove Heights on Tuesday February 6, 2018. Richardson has never held an office before. Photo by Richard Marshall for MPR News. 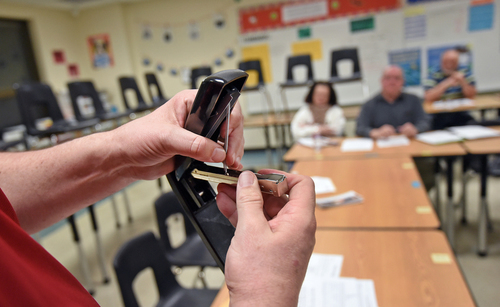 A jammed stapler brings during a sparsely attended Precinct 8 caucus meeting to a temporary halt during a Republican caucus at Inver Grove Heights Middle School in Inver Grove Heights on Tuesday February 6, 2018. Photo by Richard Marshall for MPR News. Bill Rahn of Afton, Minn., went to his local caucus and says he has "convened the DFL caucus in Afton since the Bush Adminstration ... I ain't stoppin' now!" Rahn said he's supporting Tim Walz and his wife is supporting Rebecca Otto for governor. "I want a candidate that can beat Pawlenty, should he choose to re-run," Rahn said. 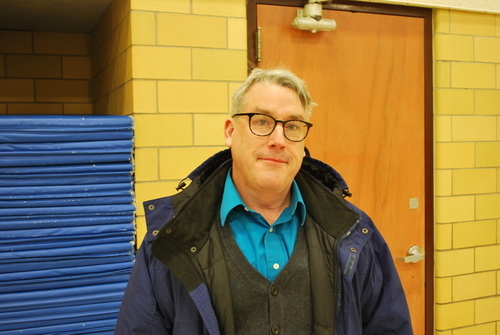 Peter Boelter of North Branch attended his caucus last night in support of Chris Coleman. "I think he in the best position to garner support from out state Minn. and our urban areas," Boelter said. "He is a solid progressive voice advocating for education, women, minorities, old and young. He has shown an ability to make improvements in St. Paul infrastructure and seems to have a solid working relationship with corporate elements in the city." He added he also likes Tim Walz and that "There may be too many good candidates to where the competition for endorsement may be an impediment to getting a democrat victory in November." Cary Anderson of St. Paul supported Rebecca Otto for governor last night. The reason? "Great environmental record, super fiscal experience, great listener, great plans to revitalize rural areas, against sulfide mining with the fiscal reasoning to back it up," Anderson said. 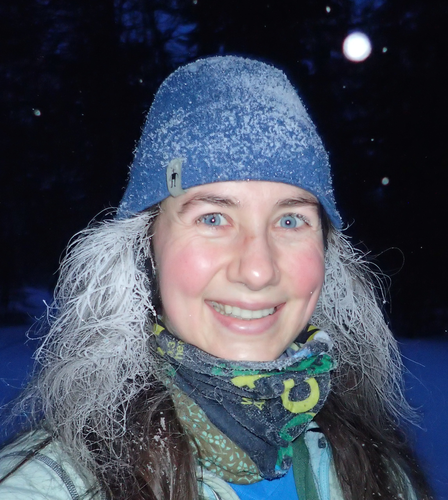 Tess Dornfeld of Minneapolis attended a caucus last night, saying "I wish they did not carry as much weight and that we had ranked-choice elections that would eliminate the need for primaries, but in the meantime I will advocate for my candidates at caucuses." Dornfeld supports Rebecca Otto for governor, the main reason being "Sulfide mining! 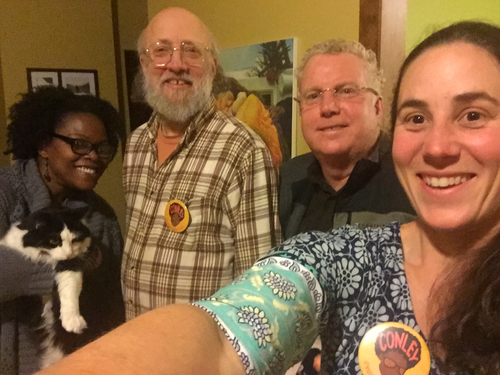 As well as her general positions and plans on environmental issues and the climate crisis, the basis for her endorsement by the DFL Environmental Caucus." Laura Geissler of Stanton, Minn., said "I caucused because I am unhappy with the direction politics is taking our country, I don’t see the moderate middle represented often in politics, and if people like me don’t get involved, we can’t complain about our problems." Geissler supported Rep. Tim Walz last night, saying "He has a good resume for governor, having been an educator and having spent time in Washington DC in Congress. He has the understanding of how politics works that we do need in the governorship. I also like that he understands both rural and urban Minnesota and has broad political appeal." Julie Stroeve of Minneapolis caucused last night in support of Tim Walz. "Tim is from a very conservative district — CD1 in southwest Minnesota. He understands rural issues very well and can bridge the outstate/urban divide. He's a level-headed politician who gets things done. I think he can keep mining out of the Boundary Waters." Michelle Natarajan of St. Paul attended her caucus last night. "There were fewer people in my caucus compared to last year. Last year the room was almost full of Hmong neighbors, but there were no Hmong people in my precinct room this year. I'm assuming they were energized last year too support Dai Thao and Marny Xiong and not impressed with the candidates for governor," she said. Natarajan supports Rebecca Otto for governor, "I don't feel strongly about this choice, but I watched a debate and Otto appeared slightly more prepared, organized and qualified than other Democrats," Natarajan said. "I also appreciate that she believes in phasing in a higher minimum wage. Some democrats say they want it now, but they need to consider making the transition easier for small businesses in my opinion. Yes, people need a living wage, but sudden change will put some places out of business." Tuesday's caucus turnout was low for the midterm elections, but even so, some community members came together to campaign and volunteer for the election season ahead.